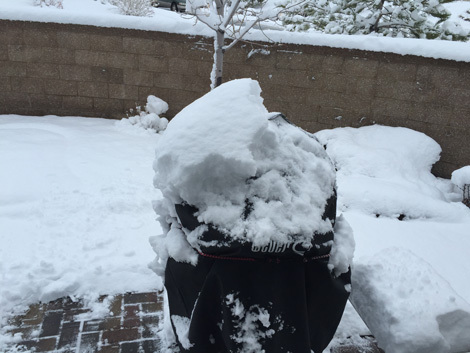 Yesterday morning, I sent pictures to my sons and sibs of the Big Green Egg covered with snow. Eric challenged that big time. 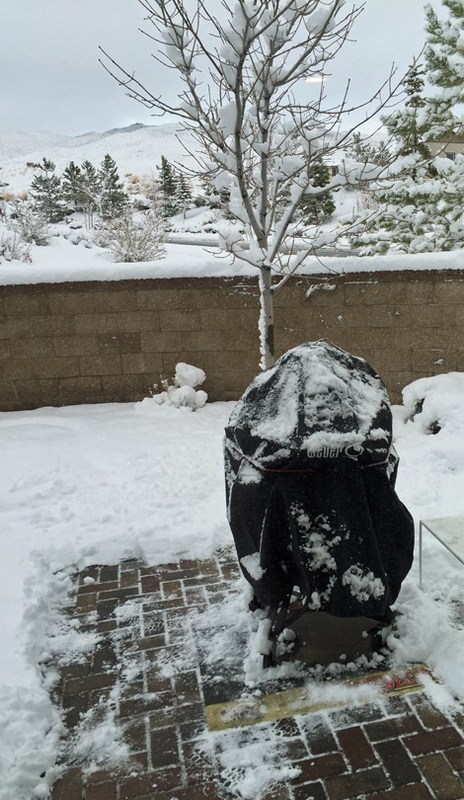 Perhaps he’s jealous… this year we got snow before they did in Maine. 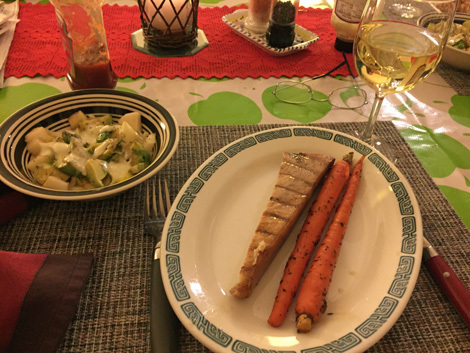 In any case, we went shopping in the afternoon — sunny and high 30’s by then — and got a piece of swordfish for the grill. I wanted something simple and easy. 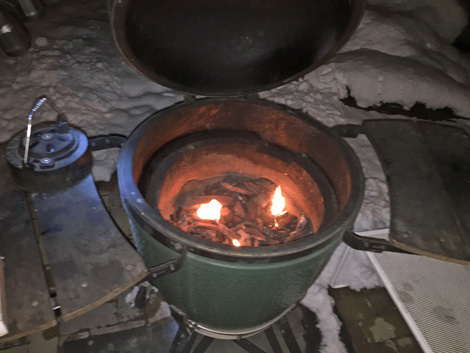 So about 4pm, while still light, I readied and cleaned the Big Green Egg — I was afraid that the lid would freeze shut or the cast iron grate would freeze to its support. No and no. Everything’s cool, in a manner of speaking. I wouldn’t cook until six, or so, but I wanted to be prepared since it will be plenty dark by then. I got out my recipes for grilling fish steak. 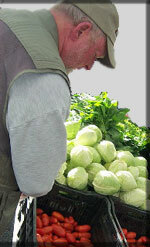 I have recipes for Grouper and Salmon, Swordfish will be much the same. 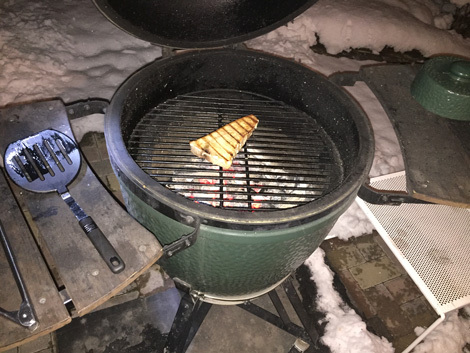 My steak, about an inch thick or less on December 11, under 30° outside and snow swept aside. EGG don’t care, but its uncomfortable for my own hands. Luckily, with swordfish, it’s a timing thing. The grill is only a step outside my kitchen door so I can step inside for most of the cooking time. 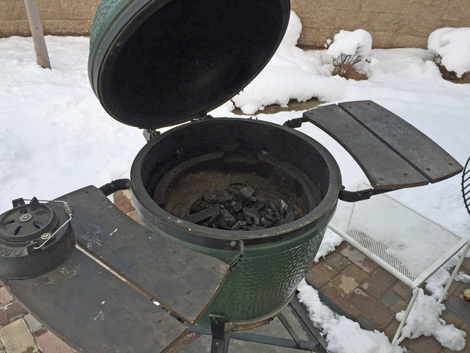 A nice 350° fire, porcelain grate, seven minutes on the first side, check temps at about 4 minutes of the second side, not yet… temps at 6 minutes, perfect., coming past 140° Close down everything, get your warm platter from inside, plate the fish and take it in. Yum. I have other stuff stocked up to grill, but I think I’ll do it with twmps at least above 40. The next morning was lovely… albeit 20°. We’re looking at the Peavine mountain range to the north of us. This entry was posted in Reno, seafood. Bookmark the permalink. I cook seafood all winter in my Webber. Masha works part time at Cooks Waremouse and swears she’ll buy me an egg using her 40% discount. Here’s hoping its this year (but probably not since she’s still in school). The snow looked nice, but not for me anymore. When I opened your blog and saw the snow egg photo, then read the narrative, I couldn’t help but think you are touched in the head. Greeting from Tucson. It is 10 am and our thermometer just registered 42 sunny degrees. 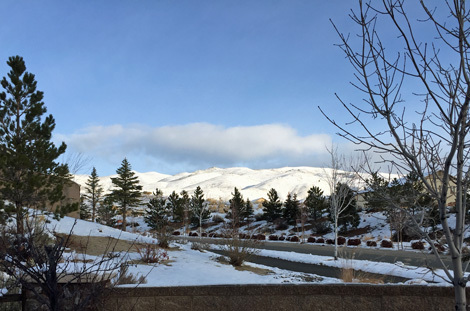 The Reno snow photos are beautiful to see. But sunshine is beautiful too! Your swordfish meal looks like it came from a gourmet restaurant. I’ve never even considered preparing & serving whole carrots. Is the salad something you created? What kind of dressing does it have? I know you are proud of your grilling skills, but sometimes the side dishes are appealing too. I wish we had some snow in Maine. Thank you for sharing your snow egg story.